On December 1st Romania celebrated its national day: 99 years ago, parts of the Austro-Hungarian and Russian empires were stitched together with the old country under the banner of Great Romania. In its essence, 1918 is a military event. Without the decisive intervention of the army there would be no Great Romania. Therefore, it might seem only natural that the peak of the national day is usually the military parade. The biggest one takes place in Bucharest, but most big cities have one, with hundreds of people attending. 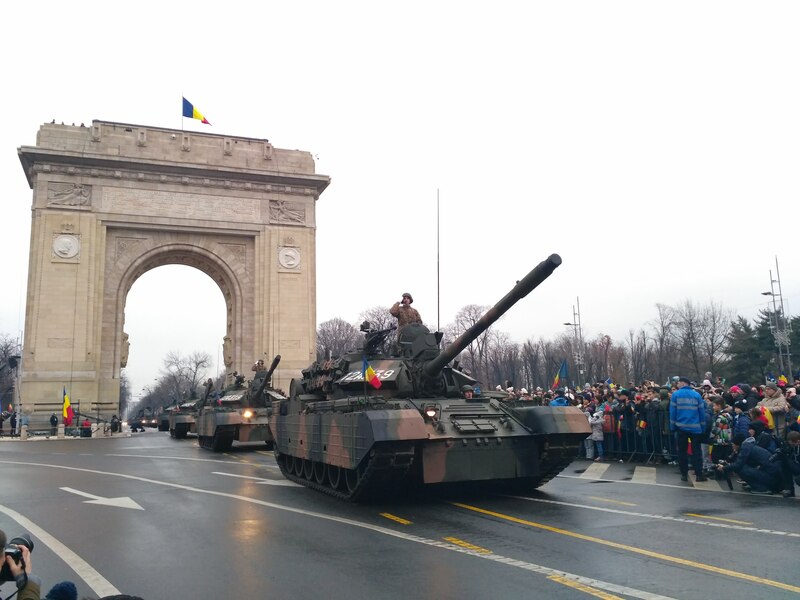 Typically, the national television broadcasts the live the parade in Bucharest: it is a genre in itself, with special commentators explaining – with admiration and pride – the elements of the parade (guns, special units and so on). Surely, there is nothing unique to this display of military jingoism during the national day. Most nations do it and it was also the habit during state socialism, although the day was different, the 23rd of August. What is significant in the Romanian case is the context and the wider implications. First, in November this year, the Romanian Parliament (with only two votes against) approved the acquisition of 4-billion worth of US Patriot missiles. The deal was on the table since the Romanian president visited Donald Trump earlier this year. Romania was one of the first countries to increase voluntarily its military budget to 2% of the GDP, before Trump was even elected. This increased budget entails a spending spree with political and diplomatic consequences. The official narrative is that we need all these weapons given the aggressiveness of Russia in the region. Ever since the annexation of Crimea, a war with Russia is being presented by officials and their voices in the media as imminent. Therefore, allegedly we need to be ready. Buying weapons is only one side of the coin. The other is the increased public presence of the military. Exercises in the Black Sea and in other parts of the country are duly reported by the media. 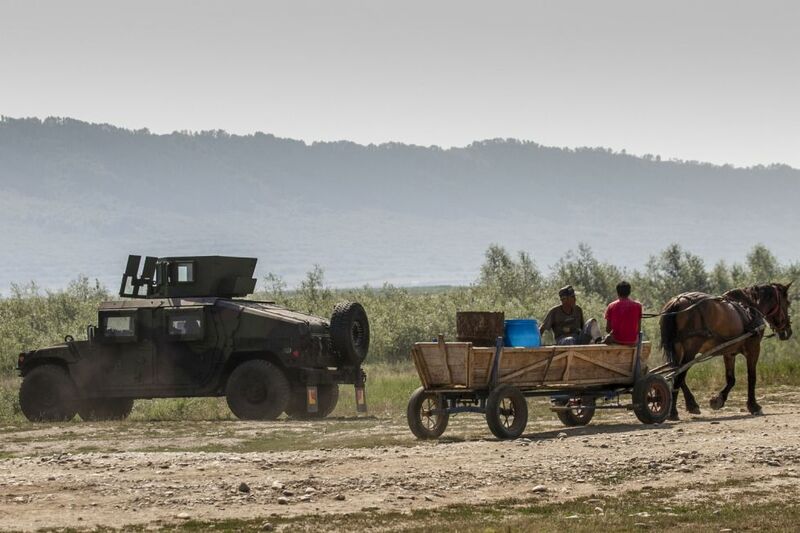 News about daily life in the two US military bases present in Romania frequently make their way to the mainstream. The US has over 600 troops permanently stationed into the country and hundreds more come for the exercises. To date, the biggest such exercise took place in July this year. This was no ordinary exercise, but a true display of force, as the numbers show: 25.000 troops from 22 countries and over 3000 units of technical equipment were mobilized for Saber Guardian, the official name of the event. 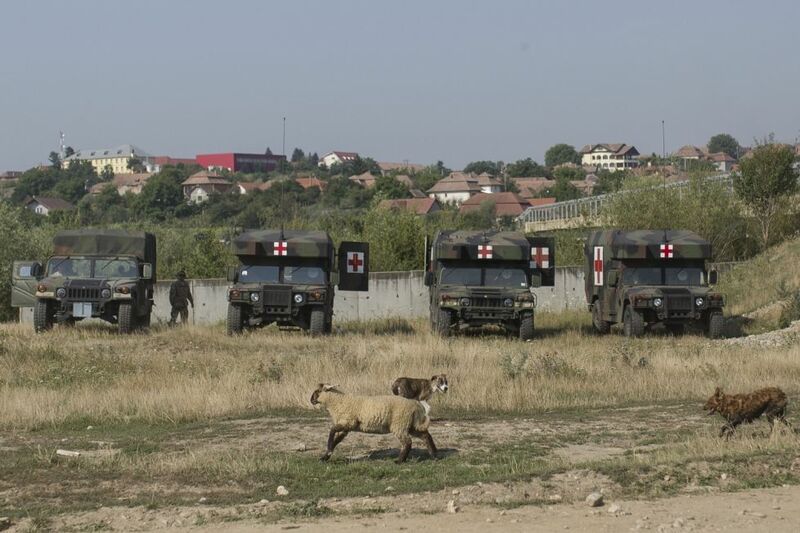 The exercise lasted for 10 days and it involved not only Romania, but also Hungary and Bulgaria. The scenario of the exercise was indicative: it simulated a response in case the these three countries of the region were occupied by a foreign country. The Russian threat was explicit. Over 200 journalists, Romanian and foreigners, reported on this exercise. A significant number, which made this not only an exercise but also a PR event. Furthermore, what was truly significant in this case was the manner in which the military blended into everyday life, especially in the areas where the trainings took place. The transportation of military equipment by trains, on the roads and by air gave the impression of a country at war. The presence of tanks and other military vehicles looked as if the cities were under siege (see photo). One of the effects of the exercise was to normalize this military presence in the everyday life as something necessary. Once confined to the barracks, the military is now legitimated in the public space as the presence de rigueur. As Weronika Grzebalska noted, Central and Eastern European societies are ”on the march”. In 2016, in Poland, Anakonda-16 became the biggest military exercise since the end of the Cold War. Earlier this year, Russia’s own military exercises on the border with Poland were met with increased display of military equipment and personnel. But this militarization is not confined solely to the military sphere. As it were, it is not only a matter of increased budgetary spending and mobilization of troops. It involves, moreover, an increased militarization of the public life as a whole. And the first victim of this militarization is politics. As the Romanian case makes it clear, the name politics is only used now in reference to internal party squabbles. For everything else, that is, for the really important issues, there is a new name: geopolitics. This is politics placed outside the normal state of affairs and outside public control. Only a few specialists, especially the secret services, can properly deal with geopolitics since what is at stake in geopolitics is the national interest and the country itself. Therefore, this cannot be treated lightly. As with any politics of exception, geopolitics tends to justify not only itself, but also everything else, especially since it carries in its name the threat of the Russian proximity. If you want to take a topic out of public discussion and proper politics, it is enough to call that topic a matter of geopolitics and the case is closed. This is what happened, for example, in the case of the parliamentary vote that sealed the acquisition of weapons. The Parliament was not called to deliberate, reach a conclusion an opinion and decide accordingly. The very institution of popular sovereignty in a liberal democracy was called to rubber stamp a decision that had already been taken by the executive branch. To put it differently, the MPs voted for their own political irrelevance and for the de facto suspending of liberal democracy, even though the latter still retains its most recognizable forms (the parliament, parties, elections, etc.). Therefore, the increased militarization of the society and its inscription into politics as geopolitics is inseparable from a real suspension of the liberal framework. Viktor Orban’s famous conceptualization of an illiberal democracy is not a Hungarian feature, but the reality in other Central and Eastern European countries as well. The putsch that never was: Romanian PSD ..
Another consequence of this increased militarization is the fact that the line between defense and offense becomes blurry. After all, the military is part of the state apparatuses and these apparatuses tend to gain autonomy, especially in cases where secrecy and lack of proper political oversight is the norm. A recent communiqué of the Presidential Administration barely made the news. This was very strange since its implications are significant. Perhaps one of the reasons for this lack of public attention was the bureaucratic nature of the document: it began with the announcement that the military budget for 2018 will remain at 2% of GDP – which everybody knew and expected nonetheless. However, buried in the middle of the text is the decision that Romania will increase its overseas forces, especially in Afghanistan and Iraq. The participation in these occupations was not discussed and the decision to increase the numbers was made outside Parliamentary deliberation in a forum that is clearly designed as a military operation unit. The Supreme Council for State Defense is an institution that does not formally exist, but it seems to be the most important one in Romania. The Supreme Council is presided by the President and consists of key ministers of the Government (especially police and the military), generals and the heads of the secret Services. While such a Council makes sense in a war situation, the Romanian one meets regularly– and informally – in peacetime to make decisions as the one mentioned above. On this particular meeting, on November 28, another key decision was made which also got unnoticed. The Supreme Council basically extended the mandate of the Secret Services – something only the Parliament was supposed to be able to do. From now on, the Secret Services are tasked not only with gathering information in order to prevent threats against Romania’s national security, but also with promoting its national interests. What this means or entails is not at all clear since it is not mentioned in the document and nobody asked. Mandating the Secret Services to promote Romania’s national interests is part of a logic that considers us already at war (especially with Russia, but not only) and it is again another example that geopolitics has replaced politics as such. We are at war, but do we really have an enemy? This question brings me to my last point. It is not the answer that is really important here, but the way in which the question itself functions as a classificatory mechanism. If one dares to question the doxa and doubt the fact that we are at war and that Russia is an enemy actively trying to conquer us (as this author and others, especially on the left do), then one is labeled a Putinist (that is, a Putin apologist) and therefore a national traitor. This is enough to be expelled from the community of serious people who can speak – that is, who speak only the language of geopolitics. To avoid this label, one of the most common strategies of objection against the buying of weapons has been to claim that Romania is too poor to afford them. Other voices suggested that the money spent on weapons should have been spent for schools and hospitals instead. But this is a bad argument: gun deals and military spending should be opposed as a matter of principle. War should be denied ipso facto. From this perspective, the most important political intervention in the current context took place on June 9 this year when philosopher and artist Ovidiu Tichindelanu curated an exhibition titled “Peace”. It excavated the lost tradition of socialist mobilization for peace and recontextualized to offer a critical comment on today’s realities. It was a clear refusal to take part in the general march of our societies.